Technical Car Experts Answers everything you need: Gear shift lever adjustment and replacement on ford explorer? 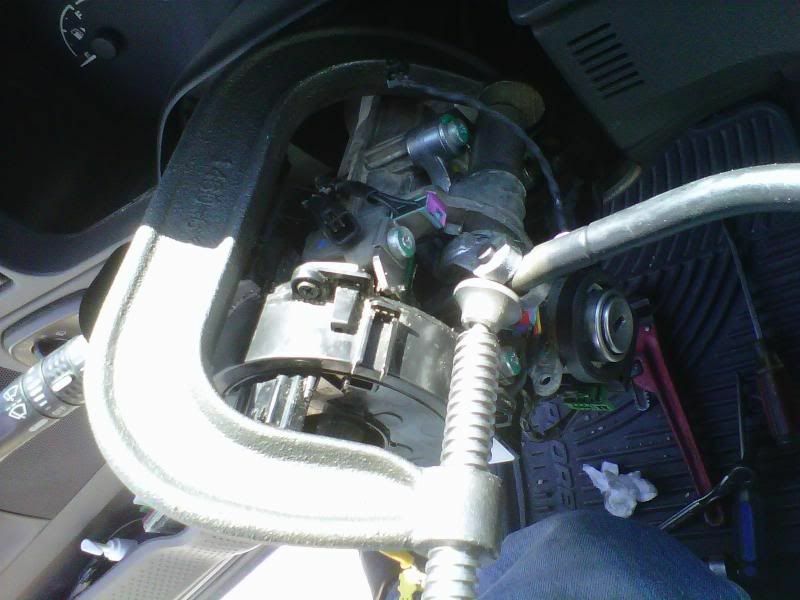 Gear shift lever adjustment and replacement on ford explorer? I received the parts kit maybe a week ago. I had some problems with it. Here is a write-up to make it work. Don't try to put it in without reading this, you may break it otherwise. The information herein is for academic purposes only. I will not be held liable in any way shape or form implied or otherwise from any damage or death caused by the implementation of any or all portions of this article. OK So here are the parts laid out. 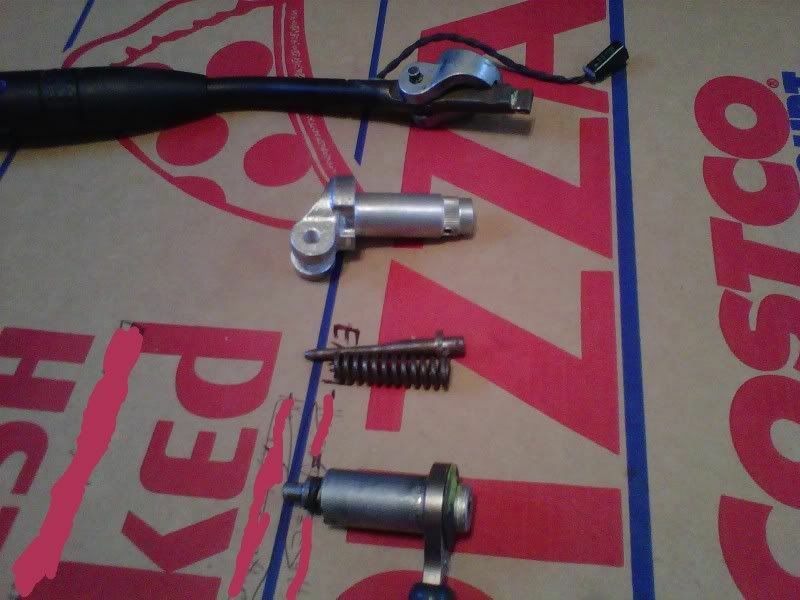 Top to bottom: Broken shift lever with piece still attached, new shifter purchased from this board, new spring and new detent, remainder of the broken shift lever. 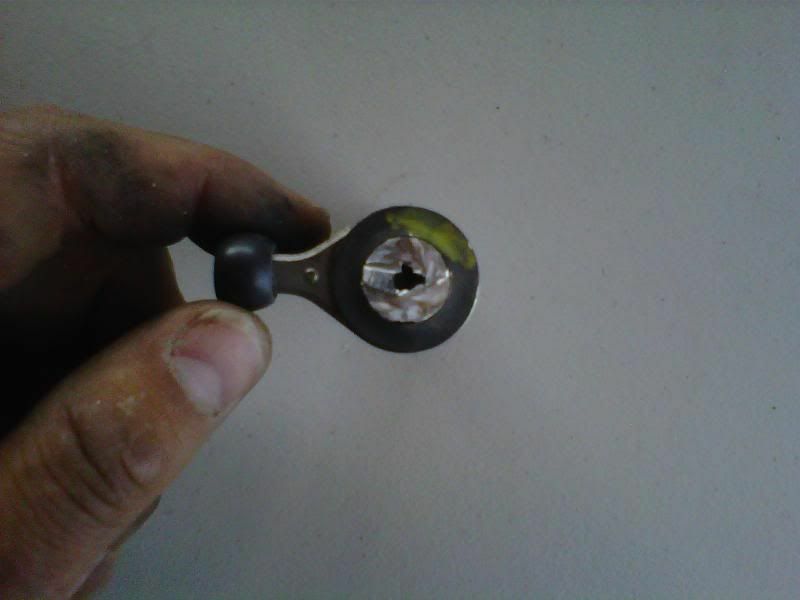 Next up is a picture of the cam end of the broken piece from the old shifter. Notice the yellow mark and the dark ring. The dark ring is the piece that holds the cam on the shift lever, and is extremely difficult to remove without destroying. I will show you how to remove it without damaging it. 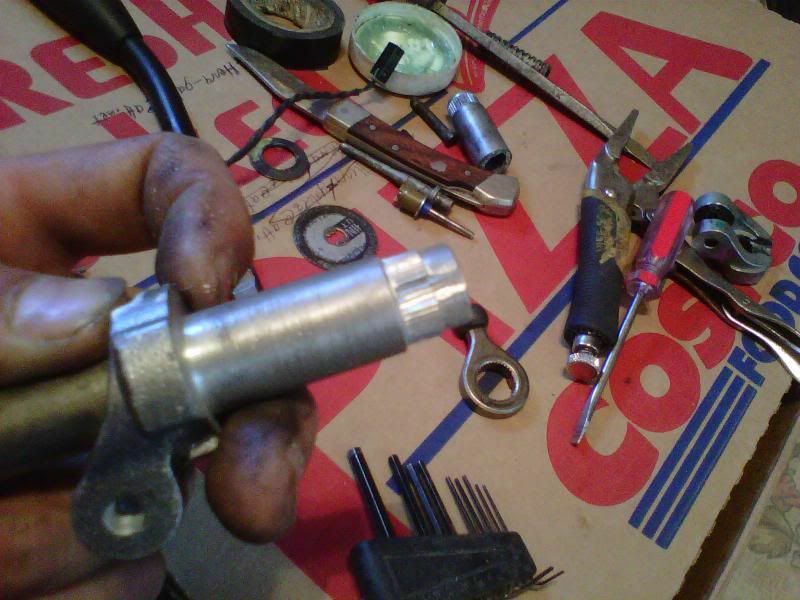 But first, you should remove the detent from the old broken shift lever. This is difficult due to the spring pressure. With this shift lever you have to push the detent out enough to allow for the slotted side, and turn it to the through-notch. 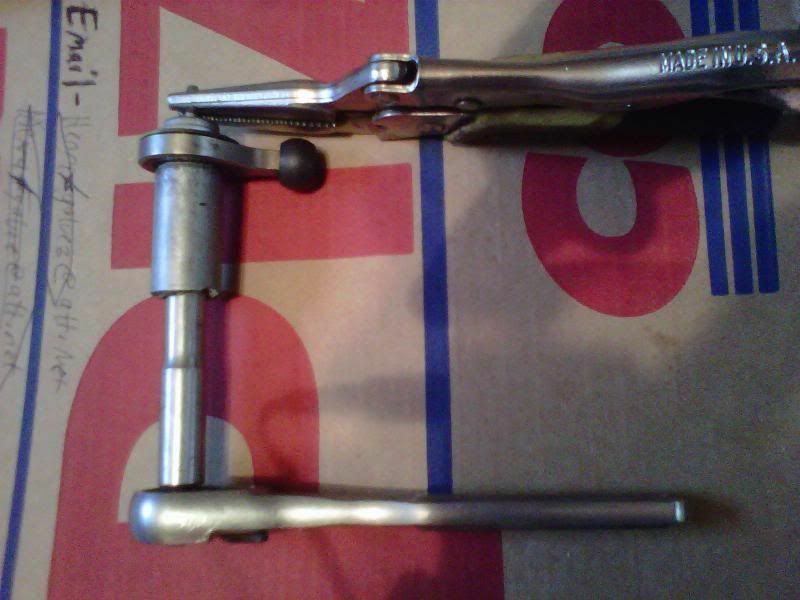 Here's a pic of the lever with the detent already out. Notice that one of the slots shows light (It is the slot that allows the detent to be removed) and the other does not. After the detent is removed, break out your Dremel. 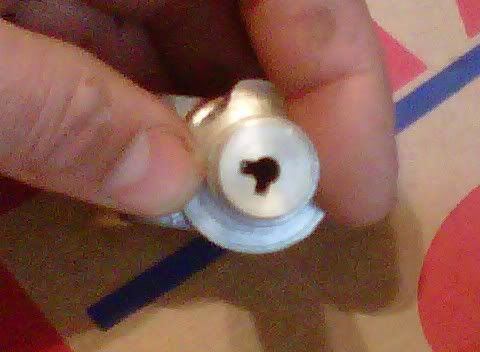 Attach a cutoff wheel and begin cutting off the tip of the broken lever, with about 1 MM between the cut and the black retention ring. See pic. Be careful not to even so much as nick the ring, but if you do, it is OK. The retention comes from a sharp lip in the center of the ring. After you get the top cut off, begin to work the center. This is where you have to be especially careful not to nick the retention ring. Get it as concave as you can. I tried using a diamond bit, but it was very tedious. I ended up just using the cutoff wheel to shape it. 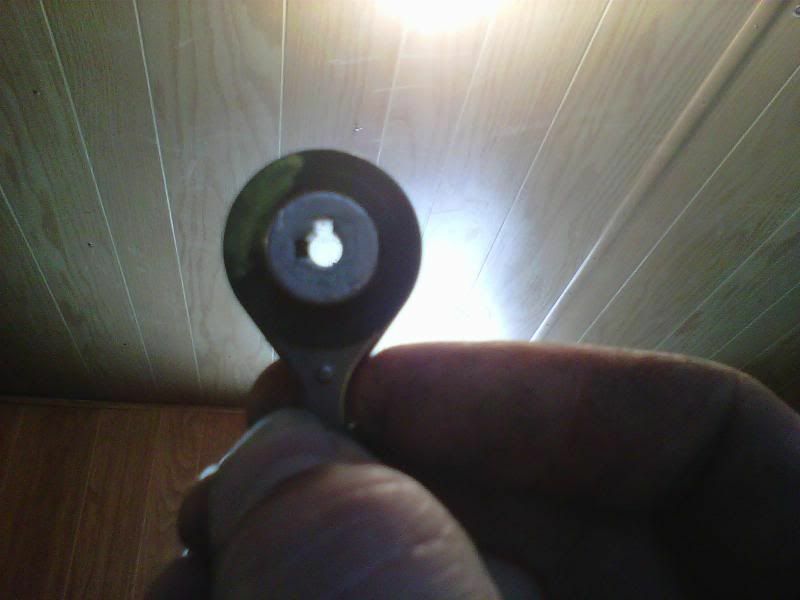 After you get it as concave as you can, use a small flathead screwdriver, and pry one end. 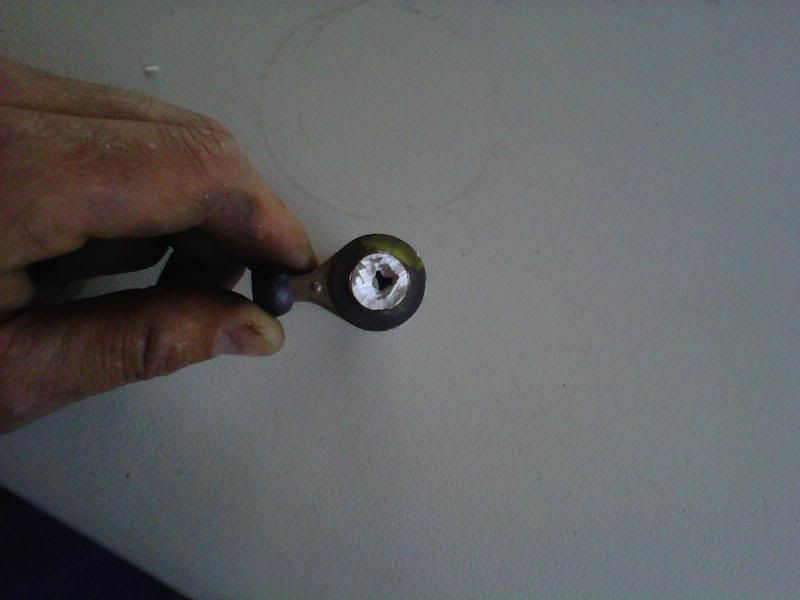 If you have to, use a knife or other screwdriver and pry the other side until the retaining ring comes off. Be careful not to lose the cam. It can go on two ways, right and wrong. Note the side that the paint is on, and where it is oriented. Once you get the cam off, you will notice that there are lots of small splines, and one large one so that it can only be oriented one way, but put on two ways. Save the locking ring. This is where the fun begins. I only have a camera phone, so you cannot see, but the new shift lever does NOT have a cutout for the large spline. You are going to have to machine on in. It is not as hard as it sounds. I used the diamond bit for it. Here you can "kind of" see the notch for the large spline. You also must machine part of the tip of the lever. I aligned both levers together and was able to get it perfectly copied. Notice the dot on the cam, and how it aligns with one of the notches. You must be aware of something-that the notches in the old and new levers are different. 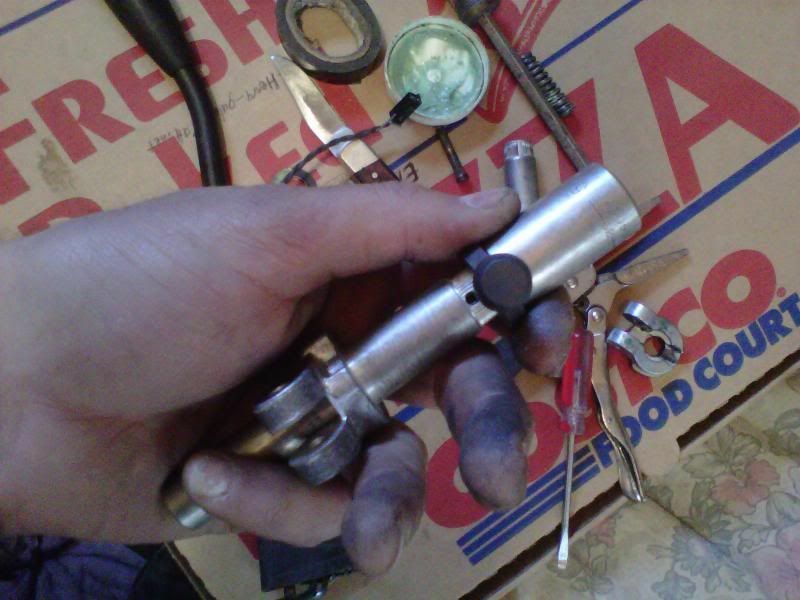 At this point, you should re-assemble the old lever, and compare it with the new one. You will notice that the new one is 90 degrees rotated compared to the old one. 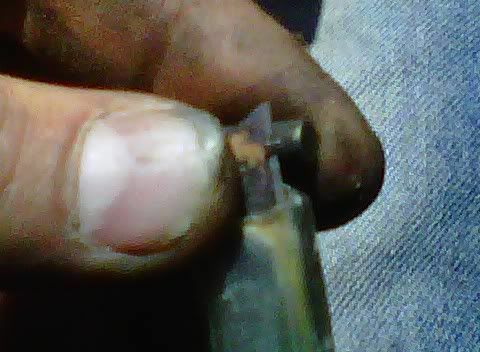 What about the alignment pin in the detent? That's why you get a new detent, the alignment pin is also 90 degrees rotated so that when it is locked, they both align up. After you machine the notch in the new lever, the fun.... really begins. Turns out, the splines in the new lever are metric, and the splines in the old lever are inch. In other words, the cam will not simply slide onto the new lever. It must be coerced with force. There are two ways to do this. The bad way, which I did, (And it worked, but don't do it) and the good way. The bad way is hammering the cam on, using a socket for stability in the new lever. 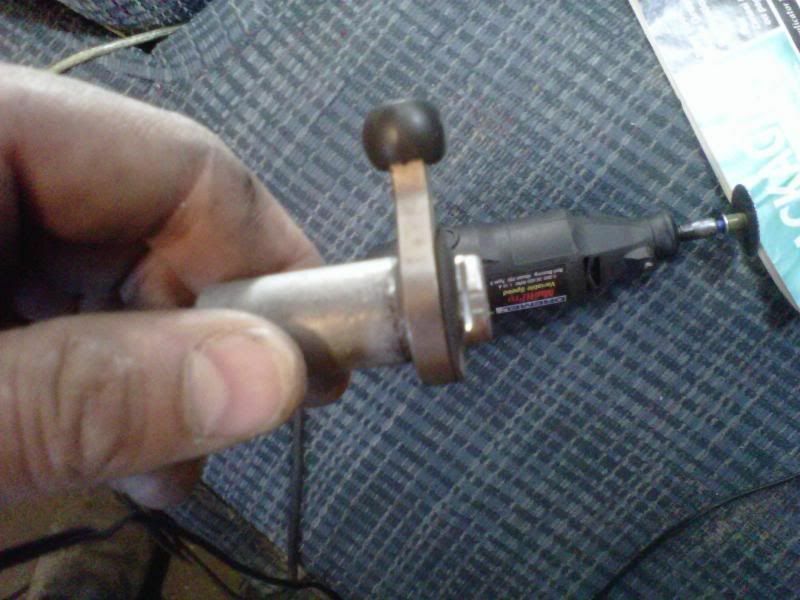 The good way is using a vice, like you would install a U-joint, with two different sized sockets. 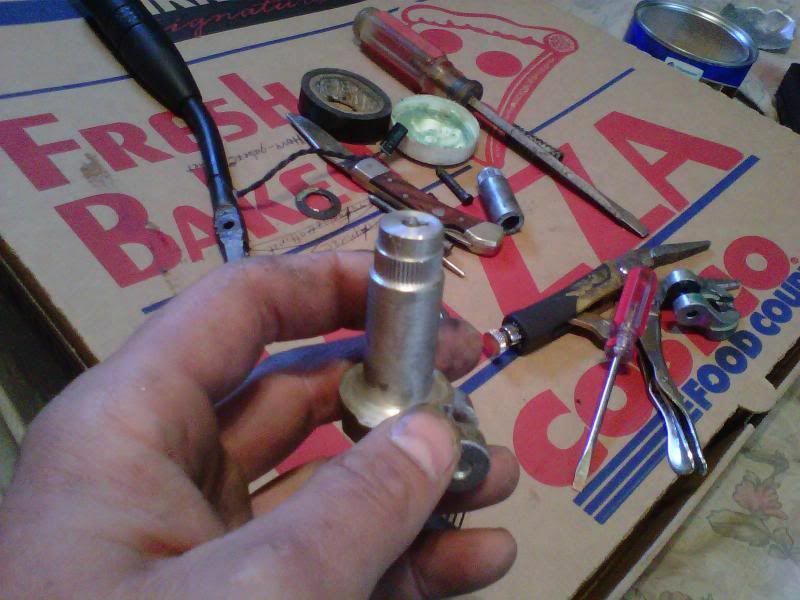 Before you endeavor this, use LOTS of grease, and be sure it is aligned correctly, with relation to the broken lever. Here's a pic of how it should look like going into the vice. A socket that fully fills the hole under the new lever, and a socket that allows the tip of the new lever to come through the cam. Now that you have the cam pressed onto the lever, remove it. 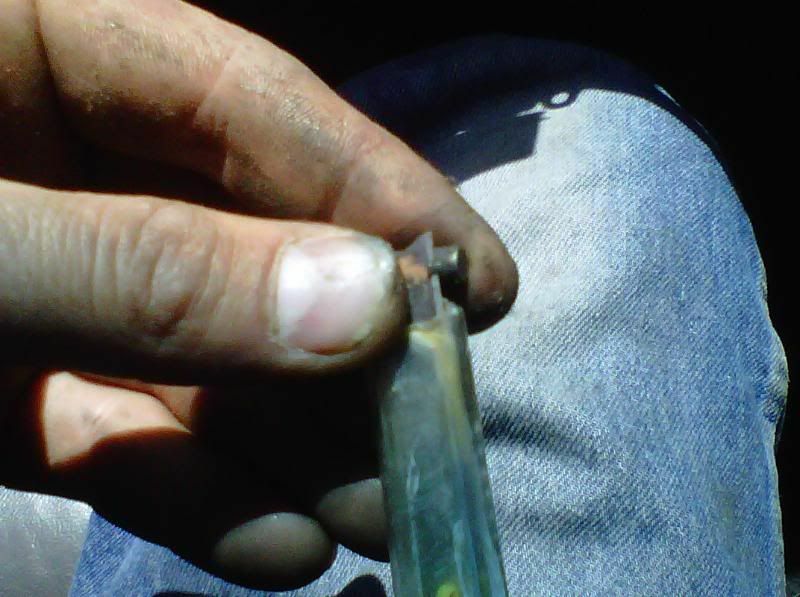 Yes, remove it, because it has to be removed to go into the steering column. Why did I have you put it in a vice, then? Because that amount of force is difficult to reproduce while it is in the steering column. As a matter of fact, you should put the cam on the new lever SEVERAL times, so that it slips on and off easily, like the old one. Otherwise, you will do what I did, and break the new lever. More on that later. But this is how to do it. You need to install the new detent that came with the new lever. Why not reuse the old one? Because the notches cut inside the levers are different. And, you will need an allen wrench to set the lock on the new lever. Make sure everything on the new lever matches up with the old or you will be sorry. 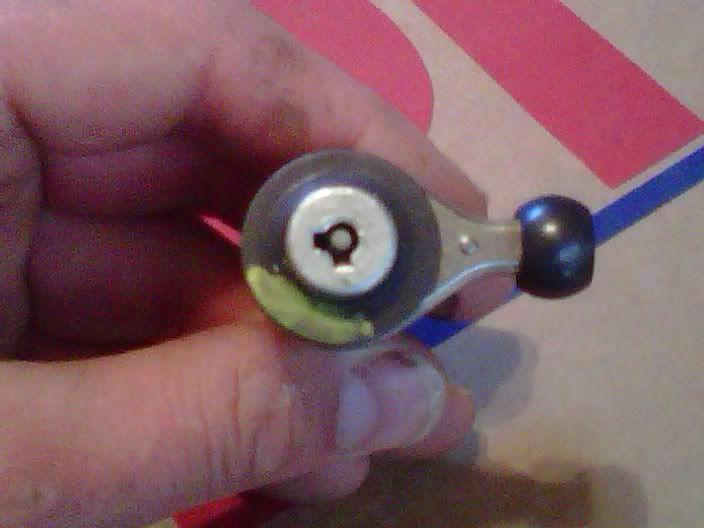 Use the socket trick to push the new detent inside the new lever. Except, you don't have to turn it. Make sure the key side of the detent slides into the slot on the new lever that houses the allen pin. 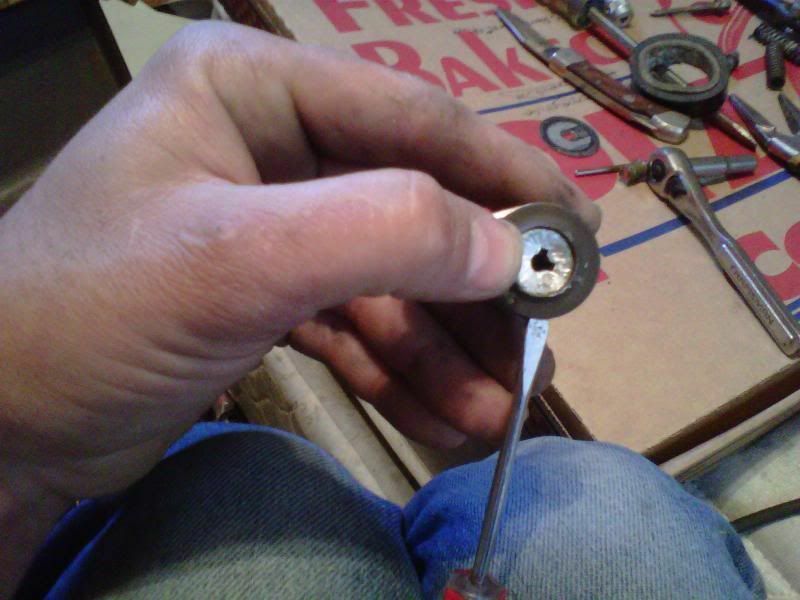 When you get the detent in far enough, turn the alley key inward until it contacts the detent. The detent may be locked in place, that is fine. 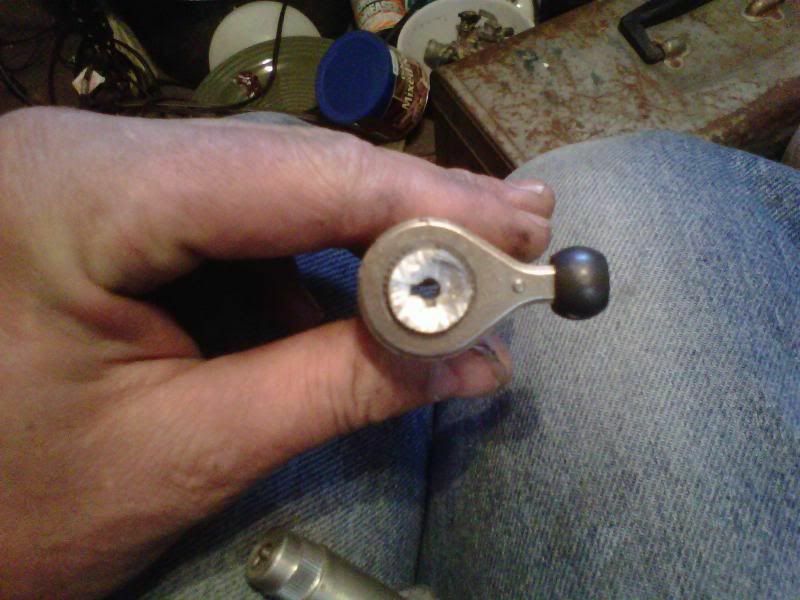 Just back the allen pin out enough so that the detent just begins to move freely, and leave it there. You can punch the side of the allen pin so that it will not back out, if you want. Now, you can put the lever into the steering column. Be sure you use plenty of good grease. Now, before you fit the cam, make sure you have it facing the right way! Once you press the locking ring on, you are done and cannot reverse your work! You have to destroy the new lever to get it back off so make sure it is right!! 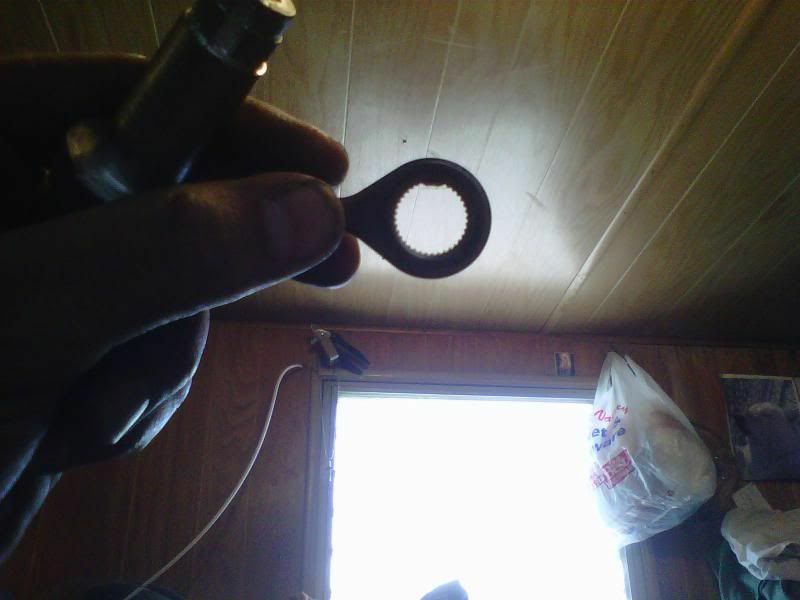 This is how you get the locking ring on. After you are sure the cam is right, one last time, break out your 6" C Clamp. You MUST remove the white indicator assembly wire housing from the steering column or you will not be straight on axis and run the risk of destroying the new lever. Break out your sockets again. You may or may not have to use this trick to get the cam on. Notice how in the pic I am not using a small diameter socket on the back of the new lever. BIG mistake, friends. Also, you will notice that the clamp is not centered on axis with the assembly. HUGE mistake. Use sockets on both ends, and remove the white housing so you can get it perfectly centered. It's the same procedure to get the retaining ring on. Use a socket. Make sure it's on good, but don't crack the new lever like I did. (I was off axis, because I did not remove the white indicator wire housing from the steering column!) Once you have the cam on properly, and the retaining ring installed, you are almost done. When you put the shifter lever back on you will notice that the pin that keeps in the lever is now quite loose. This is because there are two small slivers of metal on the end that need to be moved outward so that they make good contact with the hole. Use a utility razor and bend them outward. Sorry, again, I only have a cell phone camera. There is one final tip I have for you. If you removed your steering wheel, you will notice that the wires for the airbag and the cruise (If so equipped) are connected to a black disc assembly. Inside the assembly are not a bunch of brass contacts, but rather a long strand of wires. In other words, it is not designed to spin and spin and never bind. If you haphazardly put the steering wheel back on, you run the risk of tearing the wires that go to your airbag. Temporarily put the steering wheel back on the vehicle and make SURE the wheels are perfectly centered (Pointing straight ahead). Pop the wheel back off, and slowly, and GENTLY GENTLY GENTLY turn the black disc either way until you begin to feel resistance. Once you feel a slight resistance, STOP turning the disc, and note the position of the electrical connectors. Now, turn the black disc the opposite direction until you feel resistance again. You will count 6 full revolutions. Doing the math, that means 3 full revolutions each direction (Clockwise, or counter clockwise), and from one limit, 3 full turns to center. Please, do this right, or you may destroy your ability to be protected by the steering wheel airbag. Your reference is the electrical connector (Which must rest at 12 o clock) and the roof of the vehicle. A word of advice: do NOT count the FIRST pass of the electrical connector at 12 o clock as this is only a partial revolution, when turning it the opposite direction after resistance is felt. If you do it right, it will be exactly 3 revolution each way. Yes, I went though finding the resistance each point about 15-20 times to cement it in my brain, and to be sure I did it right. Like this: Turn the black disc clockwise until you feel resistance. Stop. Now, watch the electrical connector as you turn it counterclockwise. It will hit 12 o clock quickly, so don't count that. It may be less than 1 full turn. Continue turning the black disc, until the electrical connector hit 12 o clock. That's revolution number 1. Now continue turning it, counterclockwise (If you turned it clockwise until you felt resistance) until the electrical connector hits 12 o clock again. That is revolution number two. Now, continue turning it counterclockwise until the electrical connector is at 12 o clock. Stop! That is revolution number 3, and the disc is now centered. Put the steering wheel down and check your work! Don't take my word for it, friend! Your life may depend on you being 100% correct! Continue turning it until you count 3 more revolutions. At this point you should feel resistance. Now, do it again, backwards. I literally did this 15-20 times until I was 100% sure I had done it right. Now, you can make sure the shift cable is connected, and also the indicator wire. Make sure the parking brake is set and that the wheels are chocked, and put the lever in "D", without the engine on. Now, turn the small serrated black disc in the white indicator lever wire housing until the indicator points perfectly over the "D". It would be a shame to get it all back together and have the indicator read "N" when it is really in "D". And, start using your parking brake BEFORE you put it in "P", so that you don't have to do this again. Labels: Gear shift lever adjustment and replacement on ford explorer?